I’m starting to wonder why video game designers felt the need to add moral ambiguity. I’m pretty sure I was a happier gamer back in the old days, when I could be a one hundred per cent good hero and save the world without wondering whether or not I had made the right decision about that dragon or those werewolves. I suppose they’re trying to make it more like real life, but, honestly, if I wanted real life, would I be playing video games? Real life is that place where nothing is ever black and white and most of the time I have no idea what to do next. Video game worlds used to be clear-cut and obvious. Everything happened in a certain order and everything I was asked to do made the world a better place. Sure, I had to kill things in order to save the world, but the things I had to kill were all bad. Or I didn’t even have to kill them; I just “defeated” them. They disappeared when they were defeated and I was rewarded with a certain amount of game currency and experience and absolutely no guilt. Those of my readers who are gamers may have realized by now that I recently started playing a Dragon Age game. Those who know games a little better than they know me might have been thinking Fallout, but no, those are all too bleak to even watch someone else play. At least Dragon Age lets me play in a pretty world. I’ve started with Dragon Age Origins, which seemed a very good place to start, especially since it’s old enough to be found in the Used bin at Game Stop for less than $7.00. The decision-making started before I even got to play the game. I had to create a character. Older games might have asked me to choose gender, race (elf, dwarf, human, etc.) and class (warrior, mage, rogue, etc.) but this one asked me to choose the character’s appearance, right down to how long the nose was and how far apart the eyes were. I hear that folks familiar with these types of games can knock out characters that look just like themselves in ten minutes flat, but it took me closer to an hour. I started out trying to make my mage look just like me, but then I decided I wanted her to be young and pretty, so I made some changes. When I finally got to start playing the game, I had to make decision after decision, with every single one of them having consequences. Some were good, some were evil and some were neutral. It could be hard to tell which was which, but what happened next in the game depended on the choice I made in each situation. I met other characters who joined my party and sometimes one would like my choice and another would not. I love role-playing games, but I think these guilt-inducing games have gone a bit too far. I know these are just games and these people I’m so attached to are just ones and zeroes but it feels real when I’m playing. I find that even when my daughter watches me play and looks things up on the internet so I will know the consequences of my choices, I will end up going with my gut anyway. My current choice may make it a lot harder for me to win the final battle, but it’s the choice I have to make because that’s who I am. Speaking of who I am, Xbox Live offered me a new gamer name when I registered there so I could get downloadable content, but I chose to go with the one I’ve been using as my gamer handle for years. I’d rather be Releaf1954 than InfernalPrune50. This entry was posted in Uncategorized and tagged dragon age, Dragon Age Origins, Fallout, gaming, video games on August 26, 2015 by releaf1954. Rain and rain and more rain. That’s what it means to be in Florida in August. It’s raining as I type this, as it was raining yesterday at this time and just about every day before that for weeks. The garden likes it. The lawn loves it. I can’t say the same thing for my husband, who mows the lawn, but he was born in Florida, so he’s used to it. Grass is not the only thing that grows well in the wet season. When I went outside looking for something to paint this week, I saw lots of small blue flowers – which I’m sure my husband would call weeds – growing near the fences and under the trees. I was having a lot of trouble motivating myself to paint, so I didn’t imagine a huge landscape. I imagined one little flower on one little canvas. I looked it up. It’s called an Asiatic dayflower. Yes, it’s tiny. The flower is tiny. The painting is tiny. The blog post is tiny. 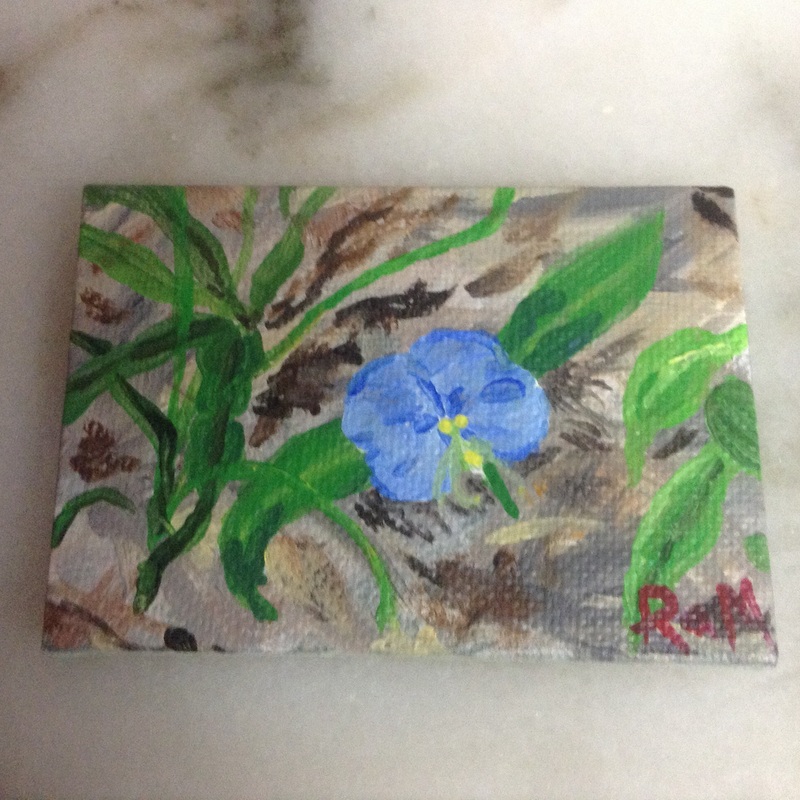 This entry was posted in Uncategorized and tagged asiatic dayflower, painting, rain on August 19, 2015 by releaf1954. I was scrolling through my cable guide one evening this week and I came across the movie, Love Story. This has happened before, of course, and my normal response is to keep scrolling. This time, though, I felt the urge to take a look. Suddenly, I wanted to remember why this movie was such a phenomenon back in 1970, when people (including me and all my friends) stood in lines that snaked around city blocks just to see it. It played at the Five Points Theater, which in those days was a swanky movie palace with one huge Cinerama screen, one of only two in the whole city of Jacksonville. I cringed a bit as I clicked the remote and then, there they were: the rich preppie boy and the poor but smart scholarship girl, trading curse words adorably and strolling through the snow while that unforgettable score played in the background. I heard that music and I was sixteen again, feeling powerful because my friends and I had arrived long before the box office opened and we were at the front of that line that snaked around the block. When we got our tickets and went inside, we trooped up to the balcony. At the time, I had a friend named John who was more of a brother than a friend. His home life was not happy, so he spent more time at our house than he did at his own and my parents accepted him as one of the gang. I have pictures of family Christmas gatherings that show John sitting by the tree, helping to hand out presents. John went with us to the Five Points Theater the day we saw Love Story. He brought a box of tissues. My favorite memory from those days is of sitting in the balcony of the Five Points Theater, watching John drop tissues down to the people weeping in the regular seats during Love Story. I like to believe they were grateful. I know I was grateful to have something to laugh about during that heartbreaking movie. Of course, we were young. We saw someone die young on the screen but we didn’t believe it could happen to any of us. We could weep for poor Oliver, a widower at twenty-four, but we felt safe in our teenaged invulnerability. That was forty-five years ago. I didn’t think Love Story could make me cry again after all this time, but I was wrong. Oh, I could get through the manipulative story just fine, if it didn’t bring back so many memories. I will never be sixteen again and I will never again be able to enjoy John’s quirky sense of humor. Like so many creative people who were full of life in the seventies, he did not survive the eighties. I won’t forget Love Story and I won’t forget my friend, that inimitable elfin spirit named John. This entry was posted in Uncategorized and tagged friendship, Love Story, memories on August 12, 2015 by releaf1954. This was not a painting week. I wanted it to be a painting week. I wished it could be a painting week. It just didn’t turn out to be a painting week. Well, at first it was because I needed to be dyeing in those early morning hours when it was not too hot to work outside. Then there were other chores that my inner critic insisted must be done before I could allow myself some painting time. Okay, okay, I did my chores. I was looking forward to Tuesday as a possible painting day, but on Sunday, I discovered a nail in my tire. By “discovered,” I mean I drove several blocks to my daughter’s house while my tire made strange sounds and I realized what they were as I pulled into my daughter’s driveway and she said, “Mom, you have a flat tire.” I called my husband and he drove over to put on the spare for me. It’s one of those itty bitty doughnut spares, so on Monday I drove to the tire repair shop. The tire couldn’t be fixed because it was too old. They could have put an inexpensive tire on my car that day and sent me on my way, but my daughter went with me to the tire repair shop and she looked up the brand on her cell phone. It did not have good reviews. They suggested a somewhat more expensive brand. My daughter nixed that one as well. We finally settled on a more reliable brand, one endorsed by my daughter’s friend who is a mechanic. That brand was not in stock, so we ordered it, along with two more to replace the other ancient tires on my car. Only one of the tires on my car was not ancient. That one had to be replaced in the middle of the Florida Folk Festival, but that’s another story. This story is about why I didn’t paint this week. Tuesday could not be my painting day because Tuesday was my day to wait by the phone for the tire folks to call and tell me my tires were in. Then I had to drive up there and wait while they replaced my ancient tires with shiny new tires. That used up all my possible painting time, but it was worth it. It was worth it because today I needed to take my son-in-law to a doctor’s appointment across town. For my readers (all both of you) who are not familiar with Jacksonville, Florida, I will explain that “across town” means a trip over a bridge, on the interstate. On the way home from this appointment, we ran into a nasty rainstorm. There was water all over the highway. If I had been driving on those ancient tires, there’s a good chance I would have been hydroplaning out there. Thanks to that annoying nail, I was driving on nice, new tires, highly rated for driving in the rain. I did not paint this week, but I also did not hydroplane, so I’m pretty sure it was a good week. This entry was posted in Uncategorized and tagged inner critic, new tires, not painting, painting on August 5, 2015 by releaf1954.